Here we go again, its FA Cup time, with our hopes and expectations exceeding probability. As the highest goal scorers in the competition we hope to increase our tally by at least double figures. When was the last time we travelled up the M6 for any great distance to see the Poppies? Have we ever played Market Drayton before, doubt it? The Gingerbreadmen are in form having won their last 4 games, sod it, hopefully not a banana skin under foot. Pharp has returned from vacating up in the Shetlands so the other PRATS will need to dig out their respirators. Market Drayton is home to Joules Brewery, which was gobbled up by Bass in early 1970’s, the brewery was knocked down in 1974 and Joules ales were lost. 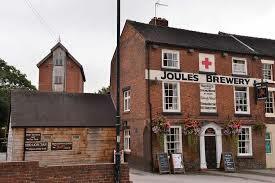 Having said that I do recall drinking some Joules ale at the Burton Brewing Museum a few years back. 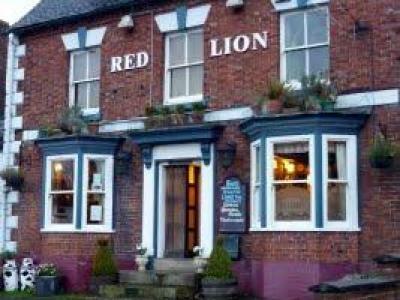 However, in 2010 Joules was back on the pump, today we intend to visit the brewery tap The Red Lion Market Drayton. http://whatpub.com/pubs/TEL/3269/red-lion-market-drayton. Cheswardine, home of the Lion’s Tale brewery. You won’t find their ales anywhere else, only here in the Red Lion. If we get time we may pop into the Woodfarm Brewery. Here’s hoping we are in the hat for the draw next Monday.